March 11, 2019 (MedicalXpress) -- If you're reading this you're obviously breathing, but are you doing it right? From the moment we're born we just do it, we take breathing for granted until someone or something takes our breath away. Most of us don't realize that as we grow up, we change the way we breathe. "Babies use diaphragmatic breathing. 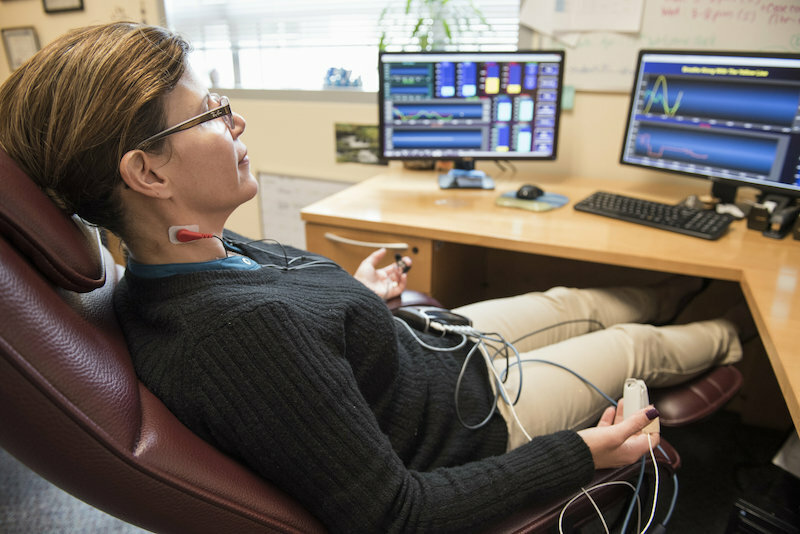 Somewhere along the way we develop bad habits that develop into thoracic breathing," says Nathaly Shoua-Desmarais, a clinical psychologist and board-certified biofeedback specialist who heads the Medical Student Counseling and Wellness Center at the Herbert Wertheim College of Medicine. Diaphragmatic breathing, also called deep or belly breathing, is done by contracting the diaphragm, a large dome-shaped muscle at the base of the lungs. It is more efficient than thoracic breathing, also called shallow or chest breathing, which uses the muscles in your upper chest. "When you breathe with your upper chest, upper lungs, upper body, what happens is you are taking in less oxygen which is vital to your body and organs," says Clinical Psychologist Melanis Rivera.